One of the most important challenges when you are building a digital product (software product) is to figure out the right balance, because maybe there will be many different team working on that product, and then you want to get small releases in a short-time. We have got a huge increment in our product development experience by participating in past projects/products, dealing with very huge issues, in different industries. We never will forget every single solution we applied in the past to make real a product. Do you know Uber, right? We create the same platform with the same technology, 4 years before Uber launched in the US. I will talk a bit more about this in another time. 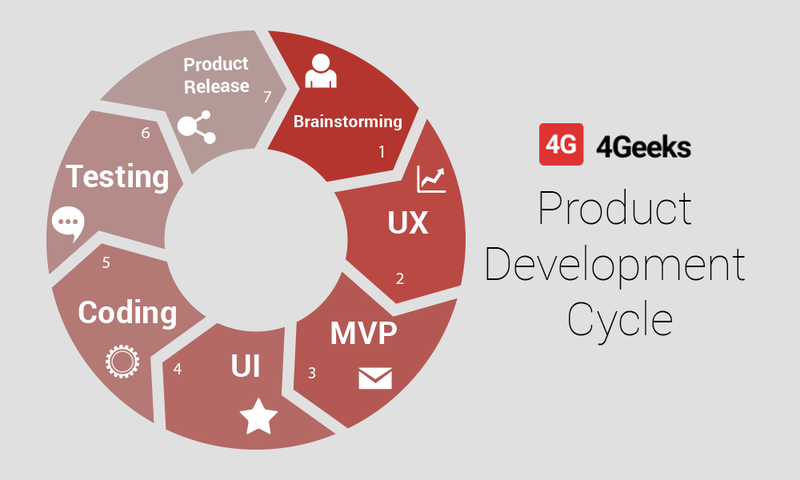 In this post I would like to present you how we solve the old product cycle by applying the 4Geeks Product Development Cycle. It includes business and technical skills. This first step is very very important, because it’s the base of your product success… or fail. If you need help to get ideas, I suggest you to read and fill out your own Business Model Canvas. It will help you to focus on some important ares like partners, competitors, value proposition. So, print a copy and take your time. I fill out my first Business Model Canvas in 2012, in a Start Weekend Costa Rica 2012, to figure out the Mall4G business model 🙂 . So quickly: Mall4G is the e-commerce platform we built… if you are curiosity you can browse the website. When you have the right features ideas to focus on this first stage, the next step is shape the idea. The make up. You need to put it a face. The User Experience is about customers happiness and customer engagement, with no code. UX it’s not about a final product, like a mobile app or website. If you don’t know what’s MVP (Minimum Viable Product), please read this blog post I wrote. As company founder, a MVP can help you a huge, to delimitate and focus on the way to get done the first product version. MVP is not about getting profit… it’s about getting feedback from users. I wrote a post about what MVP really is, and what is not. So, overview: MVP is built to learn and apply customer feedback. Since it refers to a new idea, the startup owner should acknowledge and accept the fact that a possible user reaction is unknown and probably negative. So, It’s essential to get user feedback and see if the startup has a potential. 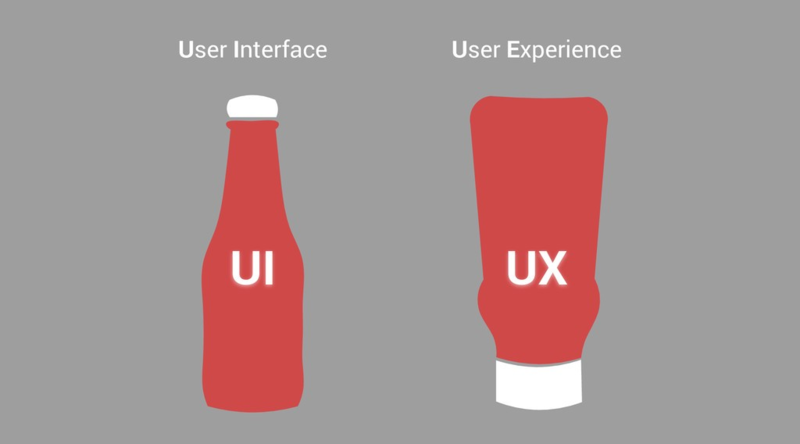 People sometimes confuse the UI (User Interface) and UX (User Experience). Let me explain you: the UI is related with the look & feel of the product. At this stage, the designers comes to the escenario to prototyping, by wireframing. Geeks loves this step, because exactly at this point, the 4Geeks engineers build the functionalities and all the business logic. Here comes the happy and the hell. Most cases, our engineers have been discussed the future product with all the team members, in order to find the better technology, servers and so. If you plan to be a strong player, “testing” will be your friend for a long time. Today there are a lot of companies creating high-level products. This is the most exciting step in the entire development cycle. Here the product with all the developed features will be published to users. I will (or some other geek here at the office) describe a bit more every single stage in 4Geeks Product Development Cycle. So, subscribe our newsletter to get it in your inbox as soon we release it. How are you dealing with issues in the software development cycle? I would like to read your comments, and get know what are you building. If you plan to build a software product or if you are already working on a software product but you need help to solve common issues, my team can guide you. Have any questions? Leave comments at the below section.